New York Yankees' Gary Sanchez, left, watches as Boston Red Sox's J.D. 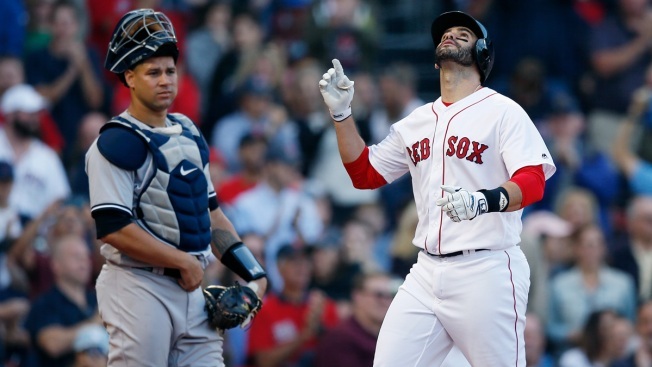 Martinez celebrates his three-run home run during the fourth inning of a baseball game in Boston, Sunday, Sept. 30, 2018. On the final day of their record-setting season, the AL East champion Boston Red Sox picked up a few more titles. Mookie Betts had another hit to coast to the big league batting championship and J.D. Martinez won the RBI crown on Sunday as the Red Sox headed into the playoffs with their franchise-record 108th win, a 10-2 victory over the second-place New York Yankees. Five days before they have a chance to meet in the postseason for the first time since Boston's epic comeback in its 2004 World Series championship run, the teams phoned in a meaningless Game 162. In all, the usually bitter rivals ran out 26 position players and 15 pitchers, with Red Sox manager Alex Cora pulling starter Rick Porcello from a no-hitter after two innings and sending out a sub for Betts so he could get a curtain call. New York has to go through Oakland first, in Wednesday night's AL wild-card game. The winner will be in Boston for Game 1 of the AL Division Series, starting Friday. Xander Bogaerts also homered for Boston, and Luke Voit hit one for the Yankees to give them a major league-record 267 home runs for the year. Betts finished with a major league-best .346 average, and Martinez's three-run homer gave him an AL-best 130 RBIs. Porcello left with a 7-0 lead and afterward was named to start Game 3 of the ALDS, following Chris Sale and David Price to the mound. The Game 4 starter could be Nathan Eovaldi, depending on what happens in the first three games. Cora said his team would have Monday off, and he planned to watch the NL tiebreakers and the wild-card games. Eduardo Rodriguez (13-5) was credited with the win by the official scorer as the most effective reliever under MLB Rule 9.17(b). Rodriguez was the fourth of eight Boston pitchers, going one inning and striking out two. Betts had already taken the field at the beginning of the third inning when Cora sent Tzu-Wei Lin out to replace him, allowing the AL MVP favorite to get a cheer on his way back to the dugout. A brief "M-V-P!'' chant broke out. Betts led the majors in slugging percentage, runs and WAR. He is the first player in baseball history to lead the majors in batting average and also top 30 steals and 30 homers. He is the first AL player to lead the majors in both batting average and extra-base hits since Mickey Mantle in 1956. Four of the first five Red Sox batters reached base in the first against Yankees starter Luis Cessa, plus an error by Aaron Judge that allowed Betts to score from first on Brock Holt's single. With one out and runners on second and third, Eduardo Nunez hit one to the right side, beyond the pitcher's reach. Voit fielded it and flipped it to Cessa, who arrived at first at the same time as the runner, tagging him but dropping the ball. Both Cessa and Nunez need medical attention; Nunez stayed in the game but Cessa was relieved by David Robertson. Cessa (1-4) got just one out, allowing four runs, three earned, on five hits. Boston added three more in the second inning. Red Sox: Nunez remained in the game after the brush with Cessa but remained in the game until he was pinch run for after a sixth-inning walk. Yankees: New York finished 100-62, its 20th 100-win season and a nine-game improvement over last year. The Yankees had the third-best record in baseball, behind Boston and Houston. ... They join the Pirates as the only teams to play twice in the wild-card game. ... Have reached the playoffs in 20 of the past 24 seasons. ... The 1997 Seattle Mariners hit 264 homers. The Yankees topped them on Saturday.... Andujar hit his 47th double, tied for second-most for a rookie in major league history. Red Sox: In winning their third straight AL East title and setting a franchise record for wins, the Red Sox improved by 15 victories over their 2017 record. ... Twelve teams in baseball history have won as many as 108 games. ... Boston snapped a three-game losing streak but completed the season without losing four in a row. It was the only team in baseball to go all season without losing four straight. It also accomplished that in 1903 and 2013, winning the World Series in both years. ... The last Red Sox player to win the AL batting title was Bill Mueller, with a .326 average in 2003. Wade Boggs was the last Boston player to lead the majors in average, hitting .366 in 1988.